Bess Wohl’s Small Mouth Sounds, directed by Shade Murray at A Red Orchid Theatre, is set at a silent retreat. Four strangers and one couple, have gathered to learn from an unseen guru (Meighan Gerachis) heard only through the loudspeaker system at the retreat center. As these characters camp out on the shores of a wooded lake coping with bug bites and bears, they reflect, communicate and seek inner peace. The lovely thing about this play is that starts as a gentle comedy then quietly approaches the profound. Wohl drops just enough hints about her characters to coax us to jump to conclusions, only to reveal our snap judgments are all backward. The cliched platitudes The Teacher spouts on the first day, combined with the comic effect of the incidental noises (the small mouth sounds of the play’s title) amplified by her microphone, might dispose us to dismiss the retreat as scammy new agey pseudo-spiritualism and the objectives of these seekers as trite. Luckily, this is not at all the case. As the conventions of the teacher/student relationship break down, the retreaters come to understand there won’t be any answers given, just space to take stock of their circumstances and perhaps, for the courageous among them, to grow. 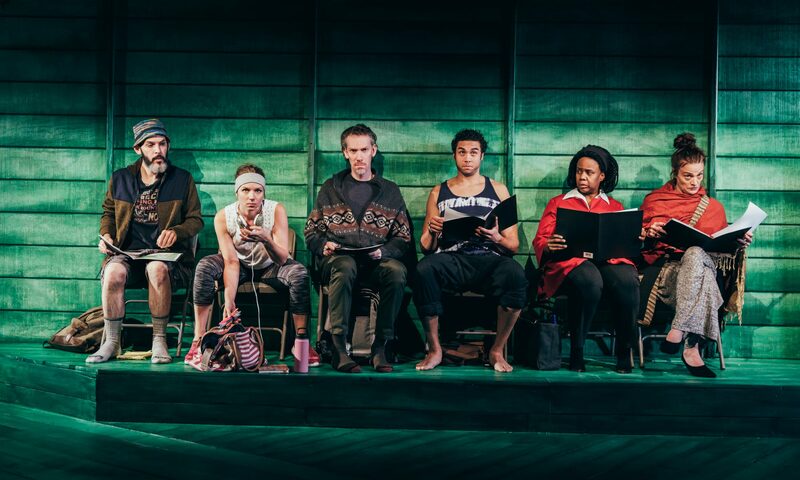 The play additionally takes up the question of whether trying to achieve peace during such troubling times as these is even a sane, morally sound pursuit. Under Murray’s direction the show is beautifully paced and loaded with funny, surprising and tender moments. He also gives us ample time to watch these characters just be. A lot of fascinating stuff happens when one character is alone on stage. The ensemble has done a phenomenal job of world-building. There is Alicia (Heather Chrisler) with her oversized Zabar’s cooler full of forbidden snack food. There is Rodney (Travis A. Knight) with his perfectly instagramable yoga dude persona. There is Joan (Jennifer Engstrom) with a defiant venti coffee. And there is Ned (Levi Holloway) who just really needs to borrow a pen. But the most moving storyline is a series of exchanges between Judy (Cynthia Hines) and Jan (Lawrence Grimm) that remind us how empathy becomes action, through small, caring gestures. The richly layered soundscape, designed by Jeffrey Levin, contributes much to the storytelling, as does the rest of the show’s design. Costumes (Myron Elliott-Cisneros) and props (Jenny Pinson) fill in key blanks about where we are, who we’re watching, and how these characters choose to present themselves, serving a duel purpose of locating us, as with the retreat-issued straw sleeping mats, misdirecting our assumptions and revealing revelatory truths. Satisfyingly, Wohl brings us full circle in the play’s moving final moments transforming the slightly ridiculous into the heartbreakingly sublime. Small Mouth Sounds runs at A Red Orchid Theatre until December 9th.